A few months ago, while reading one of my favorite Web comics, I came across a bit of a gem. While commenting on the endless debate between competing game console services Xbox Live and PlayStation Network, Penny Arcade‘s Jerry “Tycho” Holkins wrote something that every auto journalist knows, whether they’ve consciously considered it or not. Such profundity and brevity rarely coexist. Normally, when I know I’ll be reviewing a car, I do my damnedest to avoid any other commentary on it until I have a chance to drive it. Futile though it may be these days, it’s one of my few nods to objectivity. With the Jetta, short of isolating myself completely from the Web, this was essentially impossible. And so I learned too much. With my impressions already colored before I even set foot in the car, it took a concerted effort to reboot my expectations, especially as a former VW owner. It was a 1995 Passat VR6—my first car. It had roughly 60k miles on it at purchase (I say roughly because the original cluster had been replaced already) and hadn’t crested 75k when I sold it two years later. In the space of time I owned the car, I replaced the master and slave cylinders, the AC compressor, the PCV valve, one wheel bearing, one CV joint, one set of (run-flat) tires and one center console lid (I say “one” because it broke again weeks later). Some other parts broke or failed as well: the stick-on shift pattern on top of the shifter popped off and vanished into the back seat about a month after I bought it; the battery cables refused to remain torqued down at the posts; and part of the intake ducting disappeared sometime during the first six weeks of ownership. The cruise control worked when the mood struck (which wasn’t often) and, to top it all off, the passenger side front fender suffered a small stone chip that resulted in the clearcoat retreating in all directions, leaving a bubbled, chalky mess that was beyond my meager Blockbuster Video-supported means to repair properly. My first car, yes, and my last Volkswagen. But when I think back to my B4 VR, that’s not how I remember it. I remember a comfortable, agile, well-appointed car that left me wanting for nothing save for the sundry automotive technologies that had become commonplace in the seven years since it was assembled—like the CD player, for instance—that required only a trip to Best Buy (Blockbuster wages, if you remember) to rectify. It was decently quick as a family car for the time (even for 2002, when VQ35-equipped Altimas were only just trickling down) and it made beautiful noises. I never modified a thing on it—for lack of funds as much as anything else—but I didn’t think I really needed to. Maybe it wasn’t a reliable car, but it was a good car. Since then, I have driven just about everything Volkswagen has seen fit to sell us. Phaetons, Touaregs, Jettas, Golfs, Rabbits, GTIs, TDIs, TSIs, FSIs, VR6s, G60s, you name it. Short of the Eos, there’s no current offering that I haven’t sampled. Some are good (GTI); some are great (Golf TDI); some are adequate (Passat); some are puzzling (CC). Ultimately, all of them are decent A-to-B transportation at the very least. But this is the first VW I’ve driven in an editorial capacity, and as such, I’m experiencing a bit the same dissonance expressed above by Tycho. We’ll come back to that. Our SEL tester came equipped with VW’s 2.5L inline-five engine, producing 170hp at 5,700 rpm and 177lb-ft of torque at 4,250rpm, paired to their 6-Speed, torque converter automatic. No DSG here. Despite the high grunt-to-gallop ratio, the Jetta is actually quite sluggish off the line, and enthusiastic starts are bogged down by aggressive traction control that gets progressively worse with additional steering input. If anything, the 2.5 is surprisingly rev-hungry. Power comes on convincingly after 3,000 rpm and sticks around all the way to redline, but before that, there’s just nothing. Switching to “S” mode on the gear selector yielded no improvement off the line, but did push up-shifts further up the tach even while cruising. Fortunately, once at cruise, the 2.5L provides plenty of constant-speed power at fairly low RPM in both drive modes, and will happily chug along at 35mph in 5th or even 6th gear. You won’t have any passing power there, but you won’t be fighting to keep pace with traffic, either. Dynamically, the Jetta is competent if unremarkable. Steering effort at low speeds is unusually high and doesn’t quite match up with the ratio, requiring what feels like a lot more work than one would expect in executing quick parking lot maneuvers. An autocross car, this is not. Over 25mph or so, it’s more properly balanced. Cabin isolation is decent, with usable, but not fantastic front-end feedback. While some of the Jetta’s platform mates feature fancy electromechanical steering rather than the traditional, pump-driven variety, it was cut here for cost savings. Wind and road noise are low, if not exceedingly so, and high-speed stability is good. The torsion bar rear axle only makes itself known over bad pavement, and the comfort-tuned suspension (there is an optional sport package available, but our tester was not so equipped) does a good job of mitigating axle wiggle, but between the unenthusiastic powertrain and the heavy, slow steering, you won’t feel compelled to push the SEL to the point where you’d really test the limits of the chassis. Not that the tires would allow it, anyway. Overall, the car just feels heavy, and not in a substantial way, but a lethargic, mom-I-don’t-want-to-go-to-school-today way. Much has been made of the interior cost-cutting on this car, and here’s what it boils down to: There are only three soft-touch contact areas in the front of the cabin – the armrest on each door and the center console lid (which doubles as the center armrest). That’s it. All other surfaces are hard, black plastic or hard, grey or silver plastic. 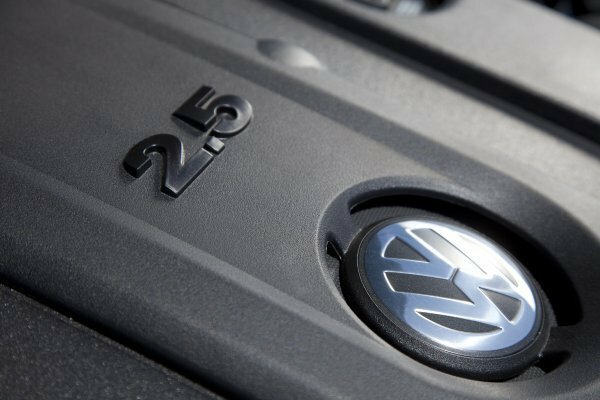 To VW’s credit, the black far exceeds the gray. And as for VW’s famed “real metal” accents? Only the steering wheel accent, door handles and gear selector trim are shaped from the real deal. The alumi-like inserts in the doors and dash are painted plastic. The flair ends there. VW’s insistence on using a stalk rather than wheel-mounted buttons for the cruise control persists, and the result is a wheel that is cluttered on one side and bare on the other. Further control of the audio system requires an awkward combination of tuning knobs and touchscreen controls to navigate. The result may look uncluttered, but operation is not. Simplicity like this works well for an iPod or a smart phone—something you can concentrate on during use. It’s not ideal for in-car entertainment. Same story with the hands-free phone interface. The seats are well-sculpted and look aggressively-bolstered, but aren’t actually very snug (again, no sport package). Leatherette is the top seat trim choice, and it’s pretty much what you’d expect. Our interior was black/black, but a beige/black two-tone is available if that’s a bit too dreary for you. Moving outside, well, with apologies to Mr. Williams, it do look like an Audi… until an Audi pull up. You’re on your own from there. But despite the size, power and equipment similarities, the 2011 Jetta does nothing to remind me of my Passat. On paper, it seems to have the competitive formula right. It’s priced for the segment and offers a good bit of equipment for the price, even if a lot of the “little things” that we notice in comparisons have gone away. What Volkswagen has here is something that looks to be quite profitable for the company and reliable for its owners. But is it good? Well, in the interest of appearing reasonable, I suppose I can only say yes. 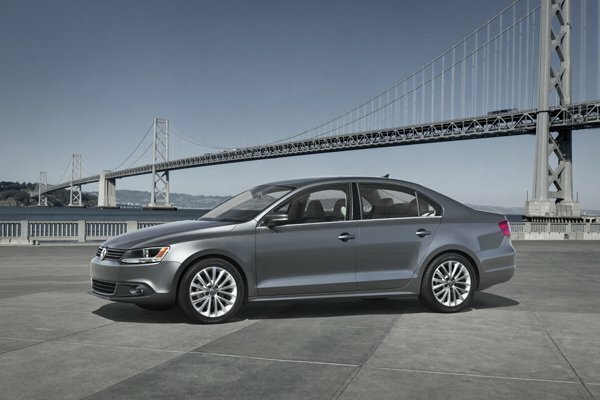 Volkswagen provided the Jetta for the purpose of this review. Correction: It was pointed out to us that the Jetta no longer features electromechanical steering as found in other MkV/MkVI chassis vehicles. The above text has been corrected to reflect this information. Thanks, Jamie. Major options: Power tilting/sliding sunroof, 6-speed automatic transmission, Titan Black leatherette interior. navigation, premium audio and Bluetooth included with SEL trim.